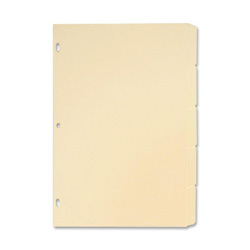 Ring Book Indexes are made of sturdy 6 point manila tag stock. They offer five tabs per set. Each sheet is punched with three 9/32" holes. Tabs extend 1/2". Manila Index Tabs and Dividers from Sparco! 1007 In Stock today.